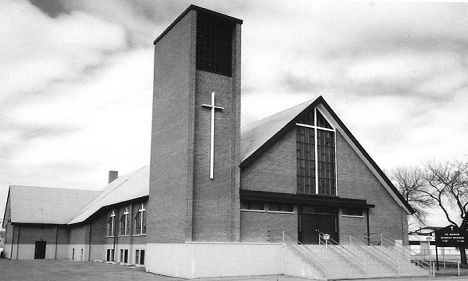 St. Mark was the second Catholic Church started in Prince Albert and was located in the east side of the city. In 1940, Bishop Duprat sent newly ordained Fr. 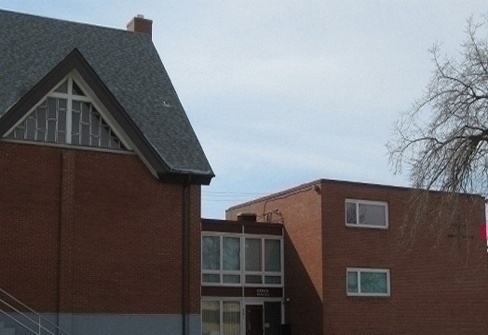 Stan Raczynski to Prince Albert to start a new church. When he arrived, there was no building, no money and Father Stan had no ministerial experience. He lived at the Bishop's Palace for fifteen years while the church was built. Father started his ministry with a few families using a classroom at St. Mark School. During the 1940's there was no money as the war was on, so in 1945 St. Mark started as a basement church and celebrated it's first Mass on November 6, 1945. Fr. Raczynski and the parishioners worked very hard to raise money by various ways to build the church. The church was eventually built and celebrated its first Mass on Dec. 24, 1957. In 1963, a rectory was attached to the church and opened in the fall of that year. Those years were good for the parish and all the activities were a manifestation of generosity and good will of the parishioners and fostered a strong community spirit in the parish. Over the years St. Mark has flourished and kept its community spirit. The church has been maintained in excellent condition and numerous renovations have been carried out. When Fr. Tremblay was pastor, the entrance to the church was renovated and an elevator was installed. Also new glass doors and windows were added. St. Mark held its 50th anniversary of the present building in 2007. The community of St. Mark still holds various community events to raise money to help with renovations and the community continues to be generous. We have a strong community spirit.